48'' Taco Cart (Made in USA by Ekono) by Ekono Catering Equipment at In The National Interest. MPN: E48-G/S. Hurry! Limited time offer. Offer valid only while supplies last. 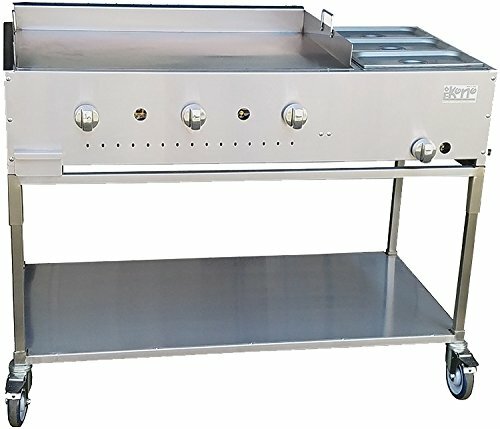 48'' Taco Cart with 3/8'' Thick Griddle Plate and Single Water Pan. It comes wit a full water pan , 3 inserts with lids and a LP hose with regulator. 48" Taco Cart with 3/8" Thick Griddle Plate and Single Water Pan. It comes wit a full water pan , 3 inserts with lids and a LP hose with regulator. 5" diameter casters (front ones with brake) and bottom shelf. All components are restaurant grade. View More In Cooking Equipment Accessories. If you have any questions about this product by Ekono Catering Equipment, contact us by completing and submitting the form below. If you are looking for a specif part number, please include it with your message.